In 1740 Sir Thomas de Veil, established a court house in Bow Street near the Opera House in Covent Garden. Ten years later, his successor, Henry Fielding, formed the Bow Street Runners. Initially nicknamed Robin Redbreasts, on account of their scarlet waistcoats, the original eight Bow Street Runners were London's first band of constables. Their functions included serving writs, detective work and arresting offenders. The Bow Street Runners travelled all over the country in search of criminals and gained a reputation for honesty and efficiency. John Stafford, Chief Clerk at Bow Street. used several spies, including John Castle and George Edwards to help arrest several members of the Spencean Philanthropists, a group who were involved in the Spa Riots and the Cato Street Conspiracy. The formation of the London Metropolitan Police force by Sir Robert Peel in 1829 brought an end to their activities. 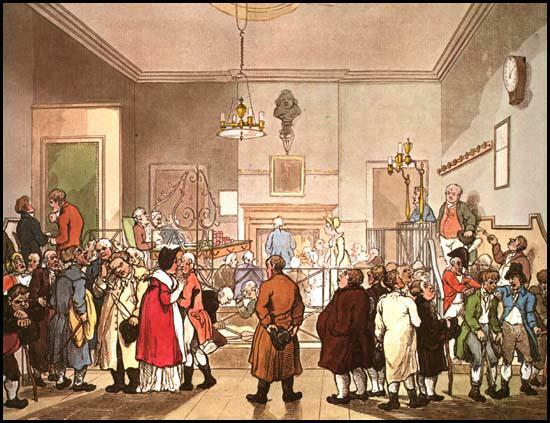 The print gives an accurate representation of the Bow Street Office at the time of an examination. This office has the largest jurisdiction of any in the metropolis, its authority extending to every part of his majesty's dominions.